We are willing to create the HTML code only for you (request code only pricing), but we strongly encourage you to go the extra step and utilize a “white labeled” version of our turn-key service. then upload it into our cloud-based email signature generator which is branded with your logo. while we remain available to handle all of the ongoing maintenance and support. Providing the email signature and installation instructions appropriate to various email programs and devices. Keeping up with new employees and signature edits for existing users. Sub-Contracting is Smart: When the development of an email signature is just a small piece of the overall scope-of-work with your client, farming it out to an expert makes good sense - after all, it is your client’s ultimate satisfaction that matters the most. 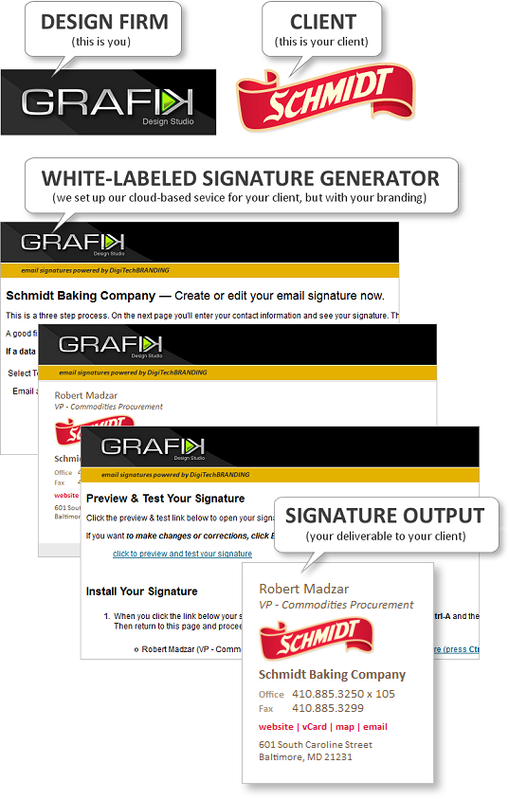 By delivering a state-of-the-art email signature service you’re going to look great! Illustration of How This Works: Our email signature generator consists basically of three webpages. On the first page the users (the individual employees of your client) enter their email address (and select their location if your client has multiple locations). On the second page the users complete a very brief form, entering their name, title, phone number, etc. This data is used to produce the finished email signature. The third page provides a link to to the finished signature as well as installation instructions (simple copy-and-paste). The entire process takes just a minute or two. Contact Us for Pricing or to Get Started: If you’re interested in our white label service please click here to request pricing, and please be sure to let us know roughly how many email signatures your customer will be needing and anything else that you feel is pertinent to the project.